Do you want to coach a team competing for championships every season? Then your team must be able to rebound at a championship-level. On the defensive end of the court, allowing your opponent to secure offensive rebounds will hurt your team's confidence, ruin momentum, and will lead to easy baskets for the opposing team. On the offensive end of the court, being able to secure offensive rebounds will lead to extra points (potentially a lot of them), increase confidence, and improve your team's energy and hustle. If your team is able to grab just 8 offensive rebounds a game, that could potentially result in your team scoring an extra 24 points a game! In 90% of games, that would quickly turn a devastating loss into a comfortable victory! When a shot is taken by the opposition, all players on the floor should rebound using this simple 3-step formula. As soon as a shot is put up, the first thing all 5 players must do is 'find' an opposing player to prevent from getting an offensive rebound. Finding a player must occur immediately after the shot release during the flight of the ball. This will often be a player's direct opponent but can get a little more complicated if your team is playing against a good offense that forces rotations and switching. As each player finds an opponent, they must establish position between the opposition player and the basket. The second step involves a player making contact with their opponent. Unlike what is commonly taught to most youth players, not all 5 players should 'box out' their opponent. If a player is defending on the perimeter, the defensive player needs to simply make contact using their forearm to prevent the offensive player from sprinting in to rebound. A player on the perimeter boxing out and putting their weight back into their opponent isn't a good idea as it doesn't put the defender in a great stance to pursue the rebound (step 3). Inside or close to the key, defenders should battle for front position and box out their opponent. Great rebounders find contact on the flight of the shot. Poor rebounders wait and allow the contact come to them. Be the first one to initiate contact! Most teams only teach their players to find an opponent and make contact (box out). This will lead to your team will give up many rebounds as the offense battles around the players. Pursuing and securing the rebound. After making contact, you must teach your players to attack the ball with relentless desire and fight to secure the rebound with two hands. For players close to the rim, this will often be battling to get the best rebounding position. For players on the perimeter, attack the basketball and look to grab a quick rebound and start the fast break. Rebounding must be a 5-man effort. With that said, let's get to the rebounding drills! The first player in line with a basketball passes to themselves off the backboard and goes up strong for the rebound with two hands, secures the basketball, and then pivots outside to pass to the next player in line. The purpose of this rebounding drill is to teach all players how to rebound in a controlled drill that lets them focus 100% on their rebounding technique. Great drill for all youth teams. Split your team up into two groups with one basketball per group. Each group forms a straight line on opposite sides of the backboard. The first player in line with a basketball begins the drill by passing off the backboard to themselves. They will then jump up as high as possible and secure the basketball with two hands. As they’re on the descent of their jump, the player must secure the basketball by gripping it tightly under their chin with their elbows out. Upon landing, the player front pivots with their outside (closest to sideline) foot as the pivot foot. The player then passes to the group they were just in before joining the end of the opposite line. Both Ends of the Court - If you have a large group and access to two backboards, split them up into four groups and use both ends of the court. It’s important that players are getting maximum elevation on their jumps to secure the rebound. On the landing, knees should be slightly bent and the player should have a wide stance. When pivoting, players shouldn’t raise up out of their low stance until after the pass. 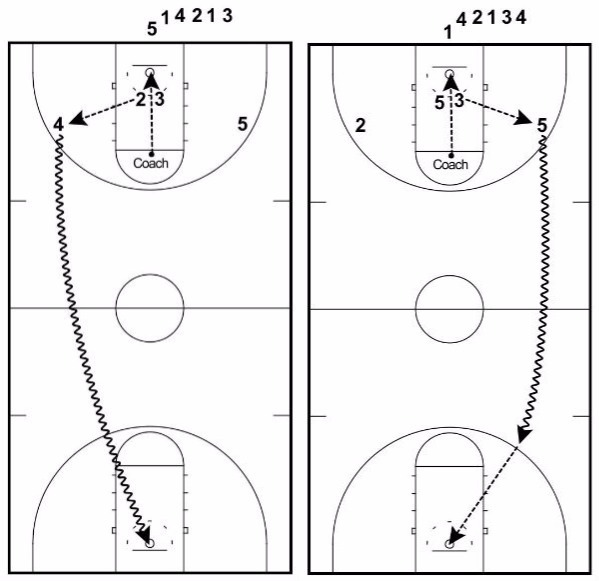 This rebounding drill is primarily run 4 on 4. The offensive players space themselves outside the three-point line and the defense starts in the key. The defense will slide from side to side and then a specific defender will close out on a shooter. The rest of the players must communicate and find a player to box out before securing the rebound. This is a great drill for giving players experience communicating, boxing out, and pursuing the basketball on a rebound. It also works on three-point shooting. 4 defenders inside the key. 4 offensive players outside the three-point line. The Coach starts with a basketball at the top of the three-point arc. The drill begins with the 4 defenders sliding side-to-side in the key. After a short amount of time, the coach passes the basketball to one of the offensive players and calls out the name of one of the defenders. The defender who is called out must box out the shooter. The other 3 defenders must communicate to each other which offensive player they’re going to box out. The goal for the defensive team is to secure the rebound. Set a number of defensive rebounds the defensive team must get before the teams switch over. Three is usually a good amount. Get three consecutive defensive rebounds in a row (made shots don’t end the streak. Only offensive rebounds). Defenders must touch the outsides of the key when they’re sliding. Be sure the defenders are putting in the effort with their slides. Nothing half-hearted. Refuse to pass the ball to the offensive team until they’re going hard. The offensive team must be ready to shoot when they receive the ball. Stutter the feet on the close-out. No jumping. Two groups competing against each other. Drill starts with 2 offensive players and 2 defensive players on the elbows. A coach or player shoots the basketball and the 4 players must battle to secure the rebound. If the defensive team rebounds, they receive one point. If the offensive team rebounds, that’s one strike. On 3 strikes the teams switch places. A tough rebounding drill that encourages players to make contact and then pursue the basketball to secure the rebound. Start by splitting the team into two even groups. One group starts on the baseline (defensive team). One group starts above the three-point line (offensive team). The coach has a basketball. The drill begins with one offensive player and one defensive player on each of the high post elbows (4 players total). A coach or player will then shoot the basketball from the top of the key. Once the basketball is released, the players start working hard to establish best position for the rebound. On either a make or miss, one of the players must secure the rebound and the drill is over. The basketball is then passed back to the top of the key and a new 4 players set up to begin the drill. The goal is for the defensive team to secure as many rebounds as possible before the offensive team grabs 3 rebounds. For each defensive rebound secured, the defensive teams gets 1 point. Once the offensive teams grabs their third rebounds (3 strikes), the teams switch roles. Whichever team finished with the most points at the end of the drill is the winner! 3 Pairs of Players - If you have a large group, you can add a third pair to the drill which means there will be 6 players fighting for the rebound. Offensive Player Shoots - Instead of the first shot not meaning anything, the offensive team can rotate through who shoots the shot. On a make, the offensive teams gets one bonus point. Both Ends of the Court - If you have another coach at practice and a large team, split them up into 4 groups and run the drill at both ends of the floor. Do keep in mind that this is a physical drill. Don’t let them players get out of hand with unnecessary pushing. Call fouls if you need to. The defensive rebounders must make contact and then pursue the basketball. Don’t wait until the basketball hits the floor. Players don’t have to match up on players a similar size to them. It’s good to get bigs playing on guards and guards playing on bigs occasionally. 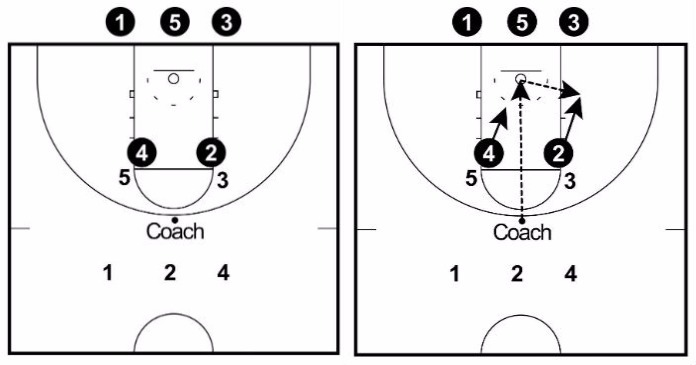 This drill involves an even number of either 3 or 4 players rotating around the key. The offensive team is rotating clockwise and the defensive team is rotating anti-clockwise. When the coach shoots the basketball the defenders must quickly find an offensive player to box out before securing the rebound. The drill then leads into a small-sided game. A fun rebounding drill variation that emphasises the importance of defenders communicating, working as a team, and making contact with an offensive player before securing the rebound. 4 players on offense. 2 on the low blocks and 2 on the elbows. 4 defenders on the inside of each of the offensive players. The rest of the players behind the baseline. Coach on the free-throw line with a basketball. The coach begins the drill by calling out ‘start’ or ‘go’ to the players. The 3 defenders start rotating anti-clockwise around the key on the inside of the offensive players in a low stance. The 3 offensive players start rotating clockwise around the key on the outside of the defensive players in a low stance. After a short amount of time, the coach attempts a shot from the free-throw line. As soon as the shot is in the air the players react and battle to secure the rebound. If the defenders get the rebound, the drill transitions up and down the floor in 4 on 4 with both teams playing both offense and defense. If the offensive team gets the rebound, the play is live and they must attempt to score at the same end of the floor. 3-on-3 or 4-on-4 – The drill can be run with teams of either 3 or 4 players. If there are teams of 3, the starting formation is a triangle. If there are teams of 4, the starting formation is a square. No Transition - It’s not compulsory to transition up and back off the rebound. You can simply use this as a rebounding drill and then set up again. It’s incredibly important that the defenders are talking to each other throughout the rotations at the start of the drill. They must know who’s going to box out who on a shot attempt. The defenders should be making contact and not allowing the offensive players to move closer to the rim after the shot. On a defensive rebound, the team with the basketball should be looking to push the basketball quickly down the floor before the defense sets up. Players must be going up with two hands for every rebound. A player must quickly get into outlet position after a rebound so that the transition from defense to offense can be done quickly. 4 pairs of players are spread out around the free-throw circle or center circle. One of the players is on offense and one on defense. There is a basketball in the middle of the circle. On the coach’s call, the defenders have to keep the offensive players away from the basketball using boxing out technique. This is a great drill for teaching players the basics of how to box out and also encouraging them to be physical with their box outs. Players get into pairs of similar position. One on offense and one on defense. The defenders are positioned around the circle with the offensive player in front of them. A basketball is in the middle of the circle. On the coach’s call, without pushing and fouling, the offensive players attempt to get inside the circle and secure the basketball. The defenders must make contact with the offensive players, get in box out position, and then do their best to keep the offensive players out of the circle. The goal is for the defensive team to keep the offense away from the basketball for 5 seconds. The pairs then switch position every 3 - 5 turns. 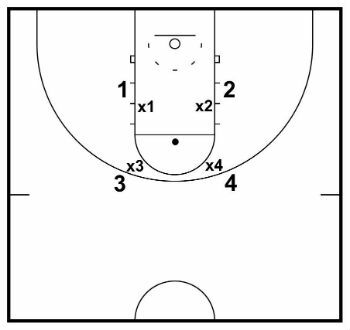 Different Number of Players - You can use this drill from 1-on-1 to 5-on-5. After 5 pairs, there’s simply too many offensive players for the rebounding drill to be effective. More Groups - If you have more than 10 players, split up into two separate games instead of making players wait for their turn. Keep everyone involved. Before using the drill make sure to go over correct box out technique with your players. They should start by facing the defender, then when the defender picks a side to attack, they make contact with them (bump them), and then pivot around into the box out. When boxing out, ensure the defenders are getting their backsides into the offensive player and keeping their arms out wide to take up more space. Balance is very important for the defenders. Make sure they’re low and wide, taking up a lot of space. The lower they are, the more strength they’ll have to hold off the offensive player. The defender must keep constant contact with the offensive player throughout the drill. If they lose contact, the offensive player can easily slip around and grab the basketball. This drill is a more competitive and advanced version of Road Runner. In this rebounding drill, two players compete to rebound a basketball inside the key and then score. Which ever player scores the basketball outlets to a wing player. The wing player must then dribble down the court and make a layup, midrange shot, and three-point shot before returning to the end of the line. This is a great multi-purpose drill to work on a variety of skills with a focus on rebounding and toughness inside the key. Players will practice rebounding, scoring under pressure, and making shots from a variety of distances. 2 players are positioned under the basket. 1 player on each wing as an outlet player. Coach has a basketball on the free-throw line. The drill starts with the coach shooting the basketball and the two players inside battling for position and then rebounding the basketball. Instead of immediately passing out, the two players inside must compete until a score is made by one of the players. The player that scores the basketball rebounds their own shot and then outlets to one of the players waiting on the wing. Then replace them on the wing. The player who receives the pass must dribble the length of the floor and make a layup, midrange shot, and a three-point shot as quickly as possible before returning to the end of the line on the baseline. Immediately after the outlet pass has been made the next player in line comes in and competes with the player that lost on the previous possession. The drill runs like this continuously for a set amount of time. No Scoring Inside - Instead of the players battling inside for the score, you can make it so that the rebounder immediately outlets to the wing player. Three Players - Instead of only having two players rebound inside, introduce and extra player. Different Shots - On the opposite end of the floor, you can vary what shots the players have to make instead of a layup, midrange, and three-pointer. Dribbling Course - Set up a short dribbling course using cones that players must complete and they dribble to the opposite end of the floor. Don’t allow anything dangerous, but allow players to battle hard on the inside. There should be no intentional fouling, but let the little stuff go. The rebounders should be getting low and wide when they’re establishing rebounding position. Encourage them to make contact and create a large rebounding area. Players must be going up strong with two hands, chinning the basketball, and landing with a strong and wide base before throwing the outlet pass. The receiver must speed dribble down the court. Don’t allow them to jog. 100% effort. Two offensive players located on the wing and corner. Two defenders in weakside positions near split-line. Coach has a basketball on the opposite wing. The coach shoots the basketball and the two defenders must box out the offensive players and secure the offensive rebound. This is a great drill to get players used to boxing out from a help position. Many players have a habit of not worrying about boxing out when they’re already in help. This drill focuses on the players finding their players and making contact when the coach goes up for a shot. Offensive players are positioned on the wing and corner. Defensive players (x1 and x2) are positioned in the correct help positions. The rest of the players form two lines. One behind each offensive player. The coach begins the drill by shooting the basketball while the defenders are in correct help positions. The offensive players (1 and 2) both crash the boards looking to secure an offensive rebound. The defensive players (x1 and x2) must leave their help position, find and make contact with the offensive player they’re guarding, and then pursue the defensive rebound. If the defense secures the rebound, they are rewarded by staying on defense while the offensive players rotate out and a new two players come in to offense. If the offensive team secures the rebound, they switch to defense for the next repetition and the current defensive players rotate out to the end of the line and a new set of offensive players come in. The drill is scored individually on how many defensive rebounds you can get. Any time a player secures an offensive rebound, both defensive players receive a point. There are no points awarded for an offensive rebound. At the end of the drill, whichever player has the most points wins! 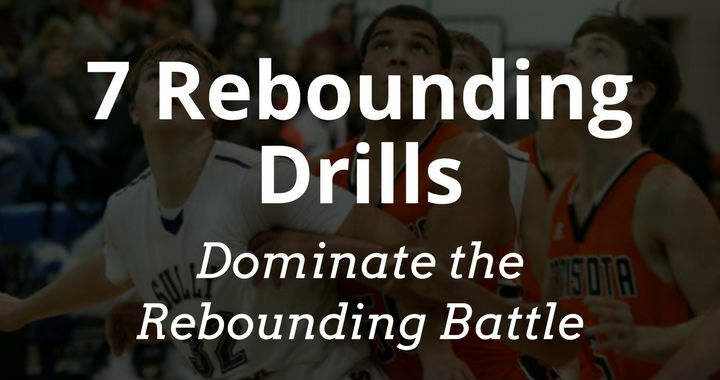 There is no out-of-bounds in this rebounding drill. Players must pursue the basketball until one of the teams secures it. Start your defenders in the help positions that you emphasise with your defense. Some have the players helping from split-line and others start them on the edge of the key. Players must alternate lines so they get repetitions from both the wing and the corner. Defenders must seek contact and be the first one to initiate contact on the box out. Make sure your defenders stay low and can always see their man and the coach who has the basketball. Remind your players the importance of boxing out in this position. Frequently, a rebound is made on the opposite side of where the shot came from. Desire is more important than skill and technique when it comes to rebounding the basketball. While using the rebounding drills above, ensure to emphasise the importance of hustling after every rebound like a championship is on the line.